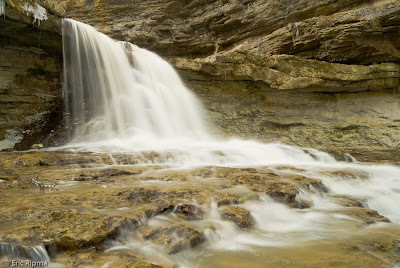 The following are a series of shots from the falls at McCormick's Creek Falls. As you can see the falls change rapidly from season to season and even within each season. Each visit the falls has something new to offer. Each of the following shots was taken from October through January in that order. As you can see the falls will freeze and unfreeze frequently and the water level is constantly changing. Check out more great Watery Wednesday posts. These are absolutely gorgeous! I love running water and waterfalls. This would be wonderful to see in person. Wonderful, I hope you keep documenting this waterfall. Nice shot, I love this,the water turn to ice.. I love to see it in reality. These are fantastic photos. You really get a sense of the way of the water - I can even hear it! This is a wonderful sequence to witness. The icicles in the third photo are so beautiful! Those are amazing falls shots. I've always enjoyed looking at the ones with ice built up in them. Thanks for sharing those. Are those water turning into ice? Wow ... interesting! Wow! Totally cool. 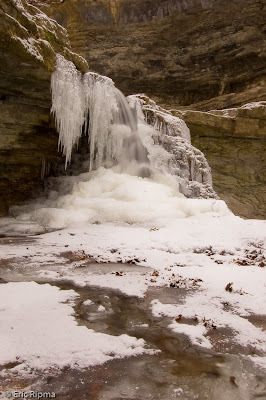 There is always something surreal about a waterfall as it slowly turns into a frozen sculpture. I love the contrast between them. You certainly have a gift - these are beautiful. Great water shots! Hmmmm i think it's nice to take a shower on the last on the water of the last photo. How beautiful and looks like a great place to visit. I'm wondering what state the falls are located in. Lovely series of images. I enjoyed this Watery Wednesday post. fabulous and very authentic waterfalls, perfect shot..
Lovely! It amazes me how they can freeze like that!! This falls is located in southern Indiana. Love the before and after (so to speak) of this water - free dancing and then artfully frozen! You captured this series nicely! They are beautiful. Icicles seems to be the theme of WW this week. But this post is absolutely spectacular. That frozen waterfall in the second picture especially is simply stunning against the brown rock. Such an interesting place. that is a fun series of shots. 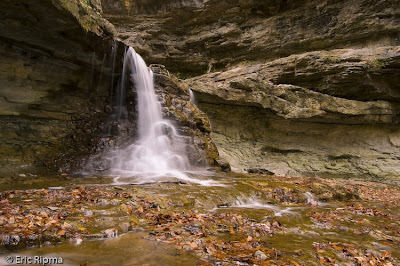 Fun to see the different seasons and I love waterfalls, running and frozen- movement captured in time. Love all the shots. I love waterfalls. 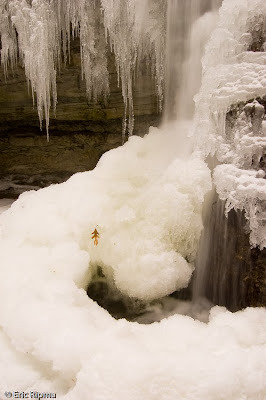 The frozen falls looks like a treasure trove of photographs. Love the sequence! And the icicles! Even if I see enough of them out my own window, they are still lovely in the infinite variety. These are a treat for a Florida Flatlander, our water usually just sits there, unless the wind is blowing! My well pump did freeze last night, but that is a rare occurence. I like this last shot!